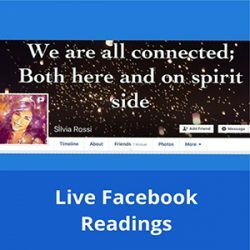 Silvia Rossi is a modern-day Psychic-Medium who has experienced spirit communications throughout her life. As a toddler she saw “shadows” in the room and as a young teen she saw “people” at the foot of her bed. Silvia was born with a gift that filled her days with images and information about people she would come into contact with. Afraid and unsure of what these apparitions of the deceased meant, Silvia tried to ignore and even suppress these experiences. Through her teens and while she attended college and graduate school, these spirits became more and more persistent in their behavior and their need to communicate through Silvia. 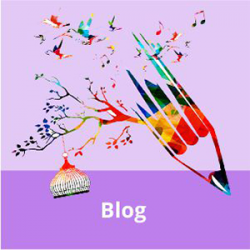 In her mid-twenties while attending meditation classes, Silvia met a fellow medium who became her mentor and guide within the spiritual world. It was at this time that Silvia began to understand that all of these experiences she was having were proof that not only did life exist beyond what we call death, but also this life was only one phase in the eternal journey of the soul. Today, Silvia understands that she has been chosen as a conduit between this earthly life and the spiritual world and she feels obligated to use and share her gift to bring comfort, information, and closure with the messages she receives from the spiritual world to those here around her. 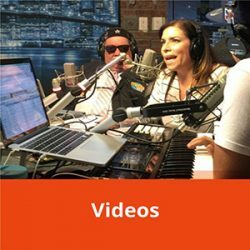 In the course of the past 23 years, Silvia has hosted her own Radio Show, Make Contact With Silvia Rossi, appeared on the Sally Jessy Rafael Show and has been a guest and co-host on the radio podacast show Creative Mojo with Mark Lipinski. Silvia was featured on Telemundo’s Al Rojo Vivo throughout the month of July 2015 and in May of 2016 and was interviewed on Univision’s Cronicas de Sabado for a segment on The New York Zodiac killer Heriberto Seda in July of 2016. Most recently, in October 2016 Ms. Rossi was an invited guest to the popular Latin morning radio show in New York City, La Mega 97.9 Vacilón de La Manana, in which she read live for the resident DJs and took questions from callers. Silvia conducts workshops to teach others how to understand and better their connection to the spirit world. She has worked with the police helping them solve cold cases and murder cases. Silvia was honored to work alongside the families and support groups of victims of the September 11th tragedy. Over the years, Silvia has garnered a loyal and ever growing clientele and following in the United States and Internationally. Silvia met John Edward at a workshop he conducted in 2003 and he was thoroughly impressed with her abilities after she relayed a message from the spirit world to an audience member at one of his events. Silvia has made it her mission to help individuals and families understand their eternal connection to loved ones that have passed on; bringing relief and comfort to the very many who have been touched by her gift. 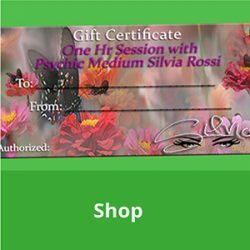 Silvia maintains a working relationship with several psychologists in the tri-state area who refer her mediumship services to their patients to assist in the grieving process. She conducts her practice out of offices in New York City and New Jersey. Currently, Silvia resides with her family in New Jersey and enjoys lecturing and teaching. Silvia also dedicates time to one of her life-long passions, singing and playing guitar with New Jersey’s own Mid-Life Crisis Band.